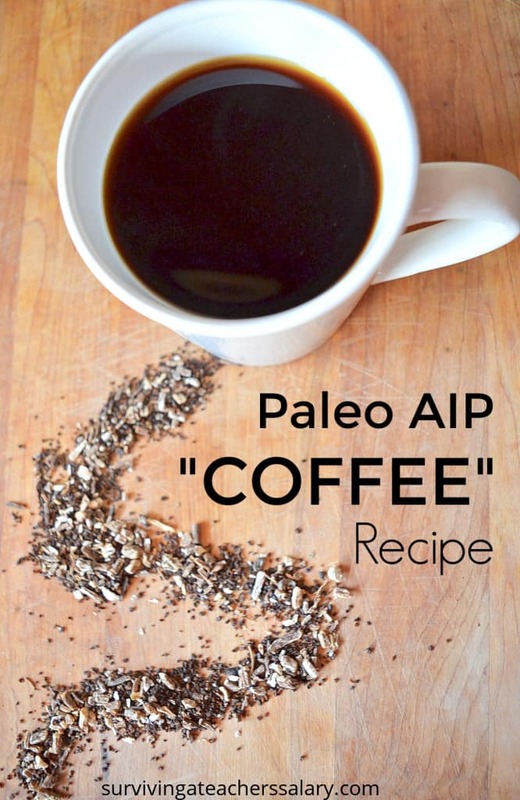 This Paleo AIP Coffee alternative recipe has NO CAFFEINE and ONLY 2 ingredients! There is no coconut oil either! 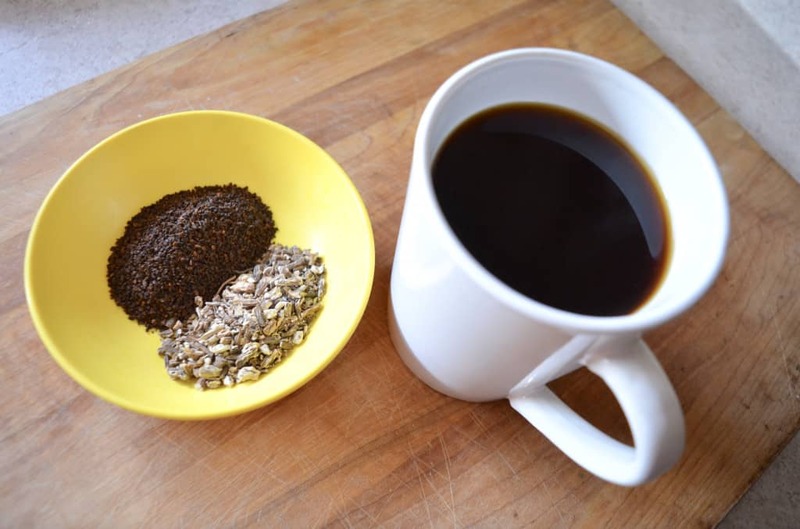 After trying many recipes I realized that people were trying to make a simple coffee recipe far too complicated so I stripped it down to the basics and found it much better! No oil, no pile of ingredients just to make a cup. Now it takes me just a few seconds to grab a cup of “coffee” on my AIP diet! For over 20 years I’ve been saying there’s something wrong with me but I just don’t know what it is. I’ve had doctors run thyroid labs thinking it was a thyroid issue but it wasn’t until the last few years that things started getting bad. Real bad. I was so fatigued I could barely walk across the room. It was affecting my ability to be with my kids and keep up with them. I woke up every morning hurting and aching so bad I felt like I was 70 years old. (I’m in my mid 30s btw.) I was desperate and in tears and needed a doctor who would talk with me. My son goes to a doctor who runs on a better nutrition/holistic style method in addition to regular MD visits so I got an appointment with her and it changed my life. Turns out I have an autoimmune disease confirmed by multiple lab tests and she started me on this AIP diet – aka Auto Immune Protocol diet. I had never heard of it before, but Paleo Mom was where she turned me to and it’s very restrictive but I feel like I did in college again. I’ve lost 25 pounds in under 2 months and have SO much more energy. I’m no longer achy – ever. No pills. No medication. Just diet. The past 2 months I’ve been trying so many AIP recipes, many of which I just do NOT like at all. I never really thought of myself as picky until I started looking at AIP recipes – haha! I don’t like beets, avocados, figs, or a lot of things that AIP recipes are based on. I’m sorry but chocolate beet brownies do absolutely NOTHING for me! Neither does avocado chocolate pudding. So I’ve been baking and cooking like crazy to find not just edible, but delicious recipes that I can make for my entire family on this diet! Coffee being an important part of that of course! Chicory Root & Dandelion Root! That’s IT! ONLY 2 ingredients! A lot of the recipes I tried added coconut oil and all this other stuff but I just couldn’t stomach the thought of drinking oil – in my coffee no less! I bought this bag of French Chicory Root and this bag of Dandelion root. Total game changer! I had it in my “cart” for a few weeks balking at spending $20 on myself for a coffee alternative but I’m mad at myself I waited that long! I’ve barely used a half of each bag and it’s been almost 2 months. This stuff goes a LONG way! I’ve learned a little bit about this combination you’ll want to know below. It doesn’t take much of either root to make your coffee and it gets strong FAST!!! I love strong black coffee but this is not one you want to steep for long! I take 1 Tbsp. of chicory root and 1 Tbsp. of dandelion root and put it in the bottom of my coffee mug. Pour boiling water into the coffee mug. DO NOT oversteep! I go by color. Most days I literally pour the water in over the root, and immediately strain it out. That’s how strong it is! 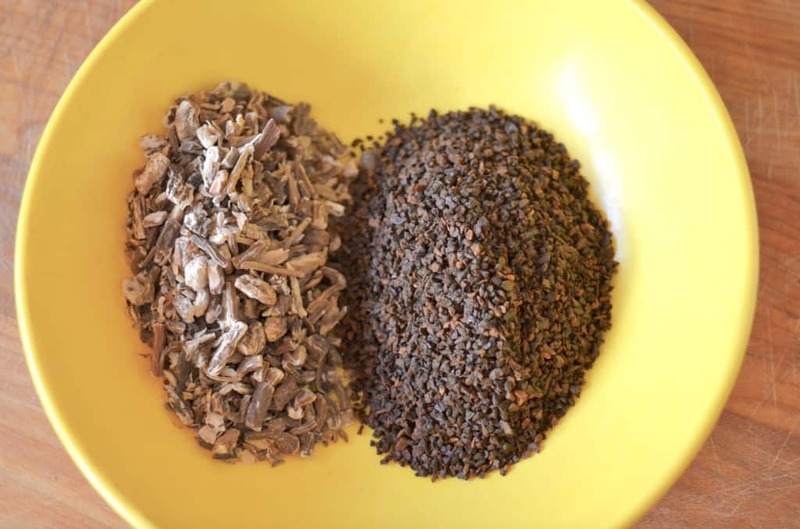 Strain out the chicory and dandelion root. ENJOY! Add any coconut milk or creamer that you drink (dairy free if you’re on AIP), or any other spice you want to steep. That’s it! 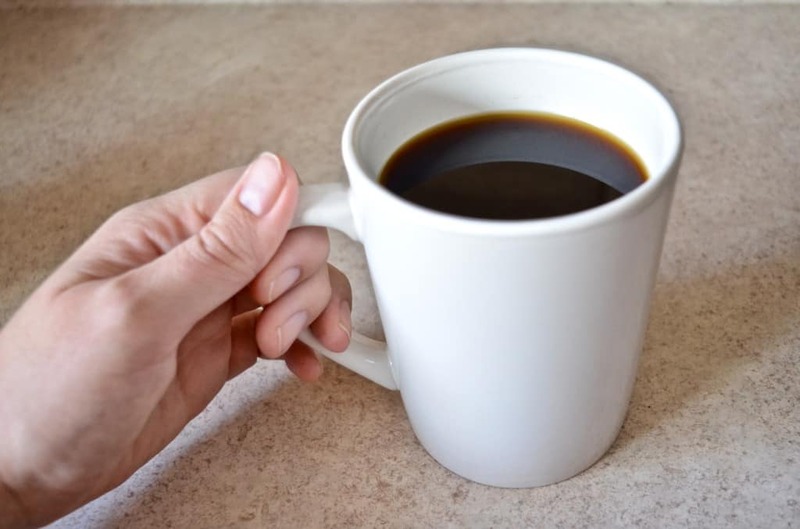 I hope this helps you find a coffee alternative if you’re on the Paleo or AIP diet! There is NO CAFFEINE in this coffee alternative! I decided to measure out and pre-mix my dandelion root & chicory root in a glass mason jar for quick easy access in the mornings. Just make sure to shake it up once in a while if it settles down and separates as the dandelion and chicory roots are very different in size! If you’ve had success on the AIP diet I would love to hear from you! This is a new journey for me but it has already helped me SO MUCH – I’m never going back. I’ll update this again after I see the rheumatologist and have more labs re-run after being on the diet for 4 months.